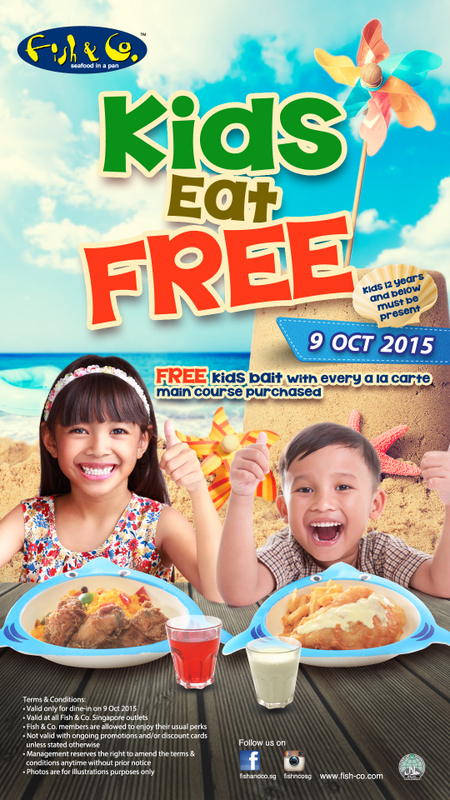 An Oppor-tuna-ty this Children's Day: Kids Eat Free at Fish & Co.! Fish & Co., a name synonymous for the freshest seafood in a pan, has a deal that is in-tuna with families with kids this Children's Day. On 9 October 2015, don't be shellfish. Treat your kids to a lovely meal at Fish & Co. because one Kids’ meal set comes free with every ala-carte main course ordered. Yes you are herring me right, and it is reely a great deal! No squidding, the monkies actually had a tough time making their up minds. And as with all kids' meals, every child cod always do with a bowl of carrots, a cup of drink (orange juice, cranberry juice, Milo or milk), and dessert (apple, banana or ice-cream). Fintastic if you ask me. Being a family-friendly restaurant, kids too have it batter when it comes to activities to keep them busy at Fish & Co,. like calamaring fun. No doubt kids will have a halibut time at Fish & Co. this Children's Day... though I suspect parents will too since it serves up a bountiful catch of great tasting meals in seariously generous portions, including this huge Iced Chocolate! Dolphinately need to share, even for me. Shoal if you wish to mullet over where to bring the kids for a good meal this Children's Day, scallop down to Fish & Co. where they eat FREE! Looks like salmon really enjoyed his meal. I do apologise however, for the over-excessive use of fish puns in a roe. I'm gillty as charged. But the bass of the matter is, there is nothing fishy about the promotion! Congrats to YEAN TAN & CHARLOTTE CHIN! You have each won Fish & Co. Dining Vouchers worth $60! Please email me at kelvin@cheekiemonkie.net by 15 Oct for prize collection details. Thanks! Fancy winning a $60 dining voucher at Fish & Co.? I'm shore you do! And I have TWO $60 vouchers to give away! SHARE this blog post of the giveaway on Facebook for a ANOTHER bonus chance! Remember to set your profile to public so that I can see the shared post. Giveaway ends on 9 October 2015, 2359 hours. Swim over to www.fish-co.com for more details and get hooked to updates at www.facebook.com/fishandco.sg. but i can't seems to find this promo on both their web and FB. just want to be double sure that the promo is still on. From what I know the promotion is definitely on. Perhaps they will announce the promo closer to 9 Oct.
2. DONE!! :p Leave your comment either in the comment section of this blog post..... fish pun??? 3. DONT! SHARE this blog post of the giveaway on Facebook for a ANOTHER bonus chance! Remember to set your profile to public so that I can see the shared post. HOPE I CAN WIN! HAVE DECIDED TO BRING THE KIDDOS ON 9 OCT!! :) Yippe Fish time! hope to win for my fish-loving kids and their blur sotong mummy! Fishly and Shrimply delicious! Hope to win! Thanks! okie noted. Liked and commented and shared at Fish&Co FB :) cheers. As a mother of 3, I shrimply hope to win the prize to give my kids a fish treat!! 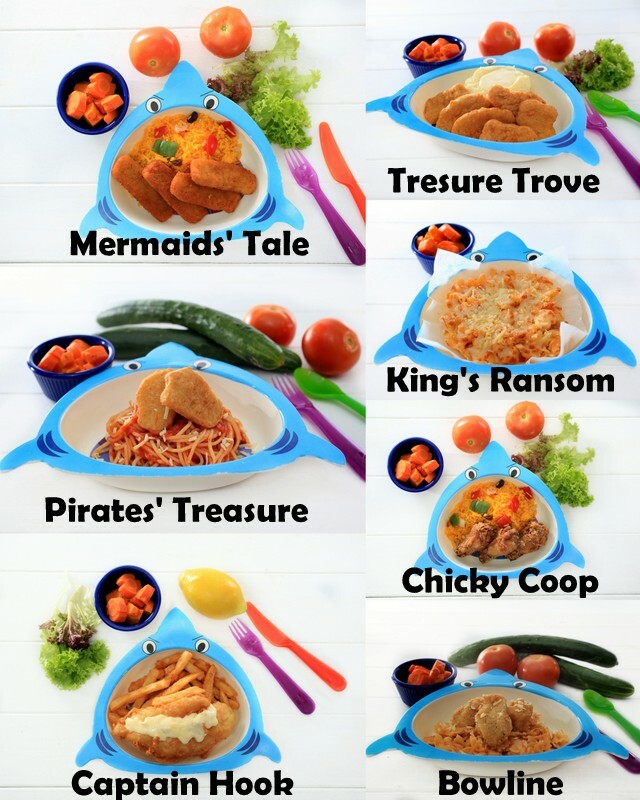 Tresure Trove for my darling boy, Pirates' Treasure for my honey boy and my sweetie pie will love Mermaids' Tale. We do not mind to burp with the smell of fresh and juicy fishes from Fish & Co!! !